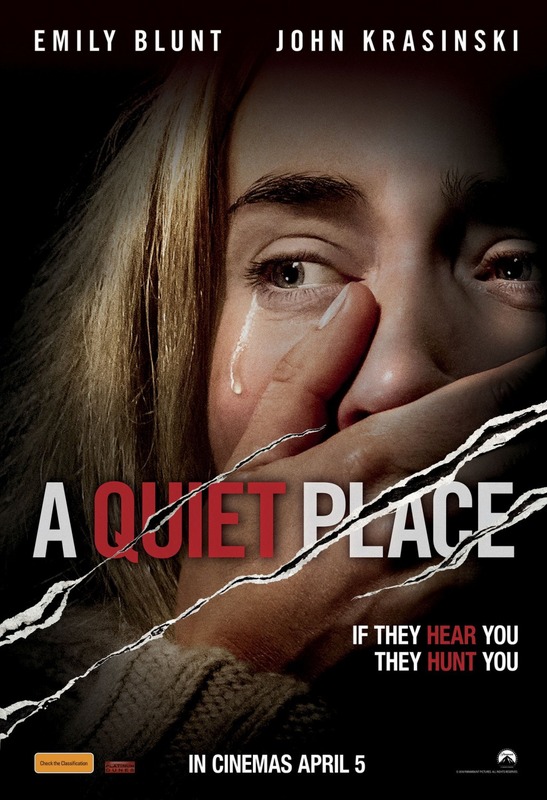 John Krasinski stars in and directs (and also co-writes) this interesting thriller/horror titled “A Quiet Place” set in a “post-apocalyptic” time where the world is riddled with these monsters that seem to have a great disdain for anything that emits sound. Sharing the screen with Emily Blunt who plays his wife in the film and also happens to be his real-life wife, we are presented with some of the finest acting performances of the year yet. The idea of this film gave me Don’t Breathe nostalgia at first; a film about a predator who is typically void of one or most of their senses except for one that is extremely heightened (in both cases, hearing) and the only way to survive is to not make a sound. Sounds familiar, right? Until you watch the movie. As you can imagine, there is not much dialogue in this film, there can’t be. The entire premise is: you make a sound, you die – and Krasinski does an excellent job at effectively establishing this and setting stakes early into the movie. The movie having close to no dialogue is what makes you gain respect for Krasinski as a director and literally everyone part of the cast too, because the movie now relies on body language and facial expressions alone to relay communication for and to the audience. And this is done flawlessly. You can see the fear in the characters’ eyes and read their emotions directly from their faces & bodies which ultimately draws you into this environment the film has created and suddenly you now are as terrified as they are. This is pretty impressive considering half of the cast is children. The chemistry between Blunt & Krasinski is also of an organic nature, which makes all the sense in the world. The film does a remarkable job of building suspense since most things are revealed to the audience first before they are revealed to the characters – “How to Rack a Nerve – Masterclass”. This was done well since the payoffs were really worth it. They held off showing the monsters or involving them in the movie at all until almost an entire hour into the film (yes, I checked my watch because I was impressed). And boy was it worth it when they eventually did. Those things were terrifying and skin-crawl inducing. What I also liked is how at the beginning of the movie you kind of expect the movie to give you a backstory about these creatures and how they got here but when the movie ends and you realise it never does that, it doesn’t really bother you because of its immersive nature, it doesn’t matter anymore. My biggest gripe(s) with the film are really nitpciks, which were basically just questionable character choices. Like, why would you fall pregnant in such an age & environment? How’s that supposed to turn out well for you? Also, how do they still have power & newspapers almost 2 years into this and wherever the power & newspapers are being generated, is there no sound there? Apart from that this is a worthy horror film that I’d recommend seeing because it is really well made and has an interesting premise and beautiful performances. The directing is also extremely good.